Senate Majority Leader Harry Reid, D-Nev., warned Thursday that Obamacare - the health care reform law that he played a key role in shepherding through Congress - risks becoming a "train wreck" because Republicans have resisted adequately funding several key provisions. Reid's comments echoed Sen. Max Baucus, D-Mont., who warned last month during a hearing with Health and Human Services Secretary Kathleen Sebelius that he sees a "huge train wreck coming down" as Congress works to set up the health insurance exchanges, a key pillar of the law's expansion of health care coverage. "Max said, 'Unless we implement this properly, it's going to be a train wreck.' 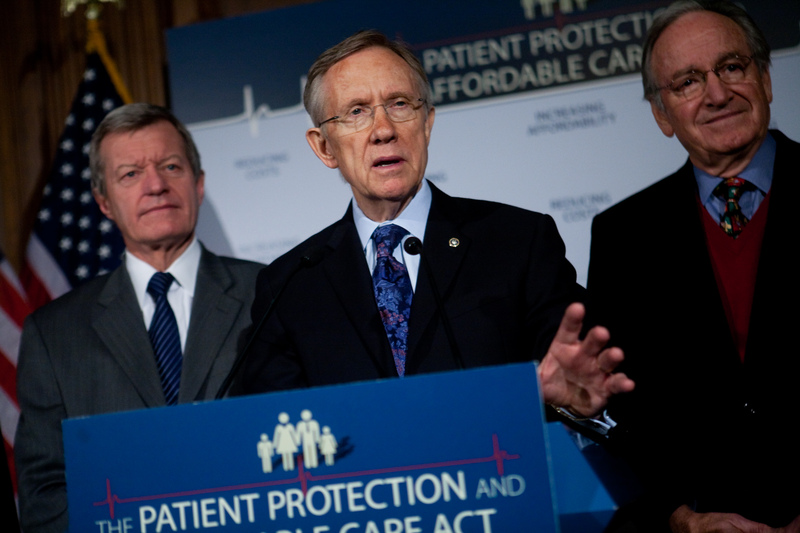 And I agree with him," Reid said during an interview with conservative talk radio host Rusty Humphries. Humphries clarified, "So we're not spending enough money, and we're not implementing it properly?" "Yes," replied Reid. "We have the menu but we don't have any way to get to the menu." Baucus and Reid's concern stems from an apparent lack of information provided to businesses and consumers about how to navigate the health insurance exchanges set up by Obamacare. Rather than funding public awareness efforts on their own, President Obama determined that he would shift money around within the health care bill to ensure that people purchasing insurance on an exchange are sufficiently informed of their options. "I wish we had some money to do this on its own," said Reid, "But [the president determined] he's going to take money from some other things that he feels are less important in the health care bill and put it on letting you and others know what's in the bill, and what they can do to either accept parts that would be helpful to them or not." Reid's comments are sure to provoke a hail of crowing from Republicans who have long scorned the law as a needlessly complex federal takeover of the American health care market. GOP leaders seized on Baucus's earlier comments to argue that not even those who wrote the law are enthusiastic about it any more. "When even a key architect of Obamacare says the law's implementation will resemble a 'train wreck,' it is clear that its biggest remaining supporters need to finally level with the American people about what's in store," Senate Minority Leader Mitch McConnell, R-Ky., wrote in an April op-ed for Reuters. "The president must step into the breach and explain to the public that skyrocketing premiums and a raft of new taxes, penalties, and fees are coming their way." "Families and businesses across America need time to prepare," continued McConnell, "and that means they need to know the facts." In an op-ed Thursday for the Philadelphia Inquirer, McConnell resumed beating the same drum. "Those responsible for enacting this bill need to prepare their constituents for the consequences," McConnell wrote. "According to a survey released this week, 49 percent of Americans do not understand how the law will affect their families, and I'm sure many have questions like 'What will happen to my health coverage?' and 'How will I be able to navigate this new government bureaucracy?'" "Democrats need to answer these types of questions," McConnell argued. Despite his concerns about funding and implementation, Reid emphasized during the radio interview that he suffers no second-guessing about the law's intent. "I believe that a country of our size, the only superpower left in the world, it's not right that we have 50, 60 million people - we had, we don't have it now - people with no health insurance," he said. "I believe the middle class and people who are below middle class deserve to go to the hospital when they're sick. You shouldn't have to declare bankruptcy when you have a traffic accident, or some dreaded disease hits your family." Reid also dismissed the charge that he did not read the law before steering it to passage. "Of course I read it. I didn't sit down on a Friday evening and read it. This legislation was drafted over a period of months and months. It took a long time to get it done," he said. "So I can pass a test on it. I know the law pretty well."